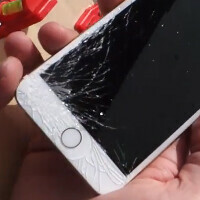 Those contraptions for preventing smartphone drop damages are starting to shape up much better now than their initial variations which include airbag deployments to cushion the blow, for instance. Straight from the US patent office comes Apple's latest grant that deals with automatically protecting your iPhone during a free fall. Thankfully, this one doesn't include any airbags stuffed inside the handset, but rather engages the sensors that are already in the handset anyway - accelerometer, magnetometer and the like - for determining quickly the side and point of impact. Afterwards, a dedicated processor calculates the needed adjustment for a fraction of a second, and engages a motor with eccentric mass to adjust the phone's position mid-air, and land it on its least breakable side, instead of face-down on the concrete, for instance. In fact, the vibration motor that is already in the handset, can be used for the purpose, just with stronger vibe impulses, compared with the ones that are used to alert you for messages or incoming calls when the phone is on mute. How about making sure that it dosen't bend first? There are report that people bend their phones when they are in the front pocket though. However, this might be one thing that is truly innovating coming from Apple in a long time. i thought everyone was looking foward to a flexible phone??? How bout using IP RATINGS instead of filing for patents and use it to sue others later one. This is fair game for patentable innovation - technical solution to a problem. Props to Apple. Nah, they ll just patent it and wait for someone else to make it happen. Then they come with their lawyers to make sure they take your invention and make you pay millions on top of that. yes, i definitely wish to have this feature! Not bad Apple, not bad at all. I doubt this would work practically. The inertia of a heavy phone falling is too much. I took a look at the phone falling face first. F=mg = 172 grams (iPhone 6+) * 9.8m/s^2 = 1.686 kg m/s^2 To counter-act this inertia, we have to balance this with the centripetal force equation, F=mrw^2 (w= lowercase Omega, m = the "eccentric mass" ) = 1.686 kg m/s^2 This thickness of a 6+ is 7.1 mm, so the maximum radius this could ever be is about 3.5mm (.0035m). Let's call the angular velocity 1,000RPM or about 100 radians/second (read: FAST) so F = m * .0035 * 100^2 = 1.686. Solving for m, m = .048 kg = 48 grams!!! 48 grams is so substantial compared to the overall weight of the iPhone, we would have to iterate to get the correct, heavier weight! Unless Apple has something entirely new (doubt that at this point), this just does not seem feasible to me. Speed. If you put the speed into the equation, the results will be different. Speed of what? The electrical motor? It's in there and estimated at 1,000 RPM which I don't think is possible to reach in the less than 1 second it would take for the phone to drop 2 meters. People didn't think it was possible to walk on the moon. Ignoratio elenchi. Google it, if you need to. In English, we'd call it a Red Herring. Maybe Google that too. The calculus ignores some variables; I don't know physics well enough to explain it in English. I looked at worst case, which is generally how you should do it. Look below (post 33) for a more realistic approach that yields a similarly unpractical mass requirement. For rotating corps F (vect) = mvr (vect)/r. So, the force is proportional with the speed (the higher the speed, the bigger the force). Thank you for the report! :) Why do you limit the radius to 3.5mm? You can have a much bigger centripetal forced if aligned with the plane defined by the screen. You just can't make the phone turn in a 3D space though. But maybe that's not needed for the protection effect and you can just relax this major constraint. What are your thoughts on this? I assumed this mass would be required to rotate in any direction, depending on the phones exact orientation when falling. In order for the eccentric mass to rotate, the diameter must fit within the phone's thickness. A 7.1mm phone thickness meant a max 3.505mm radius (I rounded for the calculations). I think this will be really, really tough to make practical. They need to focus on shatter proofing the screens. Sony had these (Xperia Z1) but people hated the coating that was required to make them shatter proof, so Sony stopped using it. Improve the coating and bring it back! Whew. Nerd alert! Lol. Just kidding man. I'm an aerospace engineer designing plane, rocket and satellite components. (Been to Space X which was freaking awesome BTW) These calculations are what I do every day. I am a super nerd and proud of it! It would be nice if the comments system allowed free body diagrams. Anyway, equating gravitational force to a counter-acting centripetal force doesn't seem to make sense. Wouldn't rotational motion over time be the controlled factor to protect the face? Mass moment of Inertia of Iphone 6+ along its height for example (I) = 1/12 * mass * (width^2+thickness^2)=1/12 * (.00778^2+.00071^2)= .00605 kg.m^2 Assuming the fall takes 1 second (t), initial angular velocity being zero, the phone spinning perfectly around (angle theta = pi radians), Theta =.5 * alpha * t^2 From there alpha = 2 * pi = 6.28 rad/s^2 The counter-acting torque (T) = inertia * alpha = .038 Nm Taking your angular velocity of 1000rpm (105 rad/s) The minimum angular acceleration of the contraption (alpha2) = 105 rad/s^2 The minimum inertia of the contraption = torque / alpha2=3.62 X 10^-4 kg.m^2 With your radius of 3.5mm, the mass = 10 grams But then you would need to account for gyroscopic torque if the phone's already spinning. Meh, negligible in small masses. Too lazy to continue. I complete agree. I tried to look at a worst case scenario where the phone has to completely overcome the entirety of the gravitational force. In real life, this would never be the case. I took the lazy man's approach. Thanks for your additions. But, I think even at 10 grams it would take up too much space and weight in the phone to be feasible.